EXCLUSIVE Make them say, “WOW!” on their BDAY with the sweetest gift around! 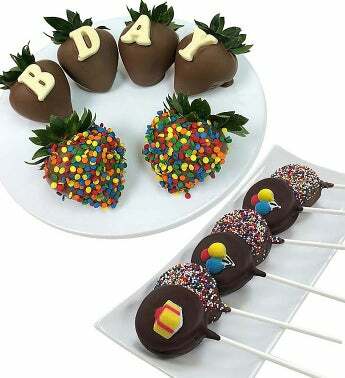 Our decadent birthday celebration bundle features six plump strawberries covered in Belgian chocolate, four decorated with white chocolate letters to spell out BDAY and two decorated with festive candy sprinkles. And what yummy surprise would be complete without 6 dipped OREO® cookies covered in colorful sprinkles and party decoration confections!